Are you ready for Spring? I sure am and my nails are too. This is "Spring Training" from KBShimmer's Spring 2013 Line. Check out the Press Release here. KBShimmer describes Spring Training as "a soft green crelly full of pink, purple, blue, and green floral toned glitters, scented with floral freesia notes." I used 3 coats for the mani above and for the one below, I used two coats over Zoya Neely. I think I prefer the three coats of just Spring Training...it's more jelly like. Spring Training is so soft and pretty. I really love green nail polish, so this is right up my alley. I didn't realize it was scented until I went to their site to type this post, so I didn't even try to smell it. I don't think it's over-powering, because I think I would have noticed if it was. I thought I'd throw in a few accent nails with Spring Training. I am wearing Essie French Affair on my pointer and Essie Borrowed and Blue on my ring finger. Now this is what I call "Easter Nails!" I have a couple more to show you from their beautiful Spring Line in the next few days - so watch for them:) As you know; I'm a huge KBShimmer fan, so I was excited to receive a few to review. Check out my other KBShimmers my clicking on the KBShimmer label on the right side of my page. 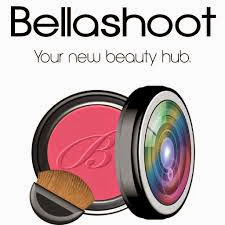 You'll notice on the website, they also sell bath and body items! Note: KBShimmer Spring Training was provided to me for my honest review. See my Disclosure Policy for more information. Wasn't this formula great? I was so happy with it. I love the way this looks against your skin. I'm glad you didn't notice the scent either, I thought maybe my smell was messed up! Nope, your "smell" wasn't messed up...well, unless mine is too? They totally look like Mini Eggs! SPARKLY Mini Eggs!! LOOOOOOVE! Haha, I know, I know ;) I wait until the end of September to stop wearing white, lol. Essie, this is super cute. I love the milky look (for lack of a better way to describe it). Yep, "milky" is about right :) Thanks for stopping by! Well if that doesn't evoke Easter, I don't know what does:-) Pretty! So beautiful! 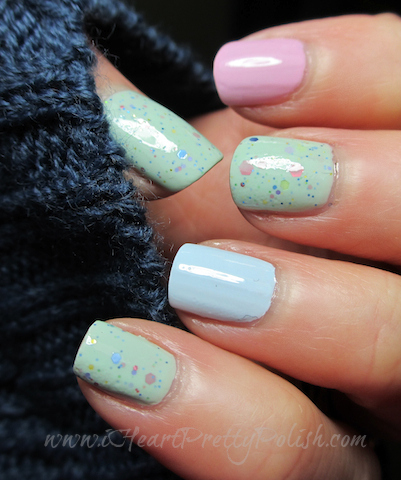 Speckled Spring 'mini egg' nails are my new obsession! Yes, they are perfect for Spring. This is so pretty!! Love the color, and jellies are my favorite! I know, Jellies are fun. Now that's spring colors! Gorgeous polish. Yep, sure are! Thanks for stopping by. Oh my gosh so spring-y - love these, now just want the weather to get a little better so it feels more like spring! Oh that KBShimmer polish looks delicious and so smooth. Gorgeous! Zoya Neely is SO pretty!